Life of a mad typer: Sally Hansen Reformulated Miracle Gel Top Coat in Blue Hue and Up the Ante. 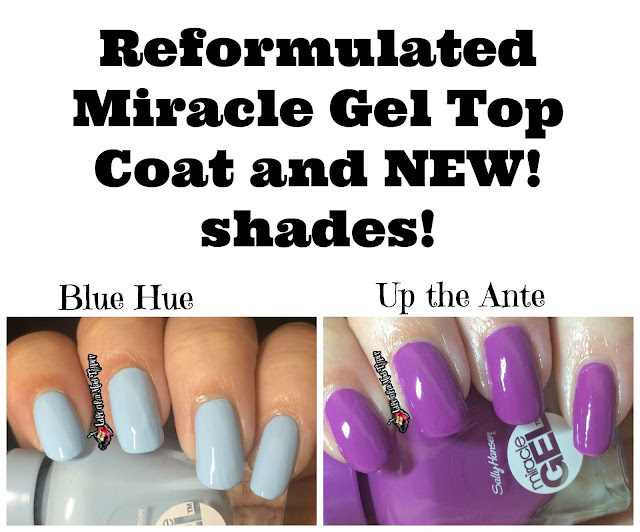 Sally Hansen Reformulated Miracle Gel Top Coat in Blue Hue and Up the Ante. Today I have 2 new colors from the Miracle gel line for review for you. Some information about the new topcoat. The new top coat made the lasting time improve vastly. Where I was only getting about 6 hours of wear with the previous version this one lasted for days. It still hadn't chipped when I removed them so I could swatch the next color. I am in love with this new formula and can't wait to try more from the collection. 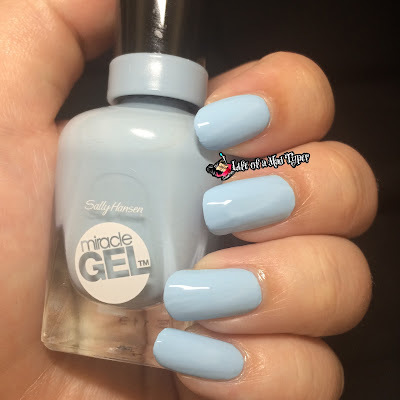 Blue hue is a nice baby blue polish that actually made me look more tan than I am!! Perfect for some baby shower nail art. I am loving this shade of blue more after seeing this polish. I love this purple and how vibrant it is. 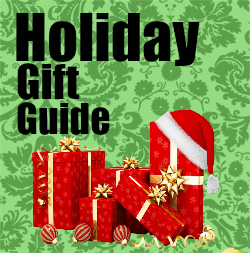 Its great for summer but can be used in the fall as well. This one is almost a one coater but I did 2 just in case. Find these babies at your local Walmart,Target, Walgreens and many other places where polish is sold. Blue Hue is such a pretty shade, and the top coat is SO shiny, I love it!! I love Blue hue, gotta get it soon.